Mohun Bagan AC have announced their withdrawal from remaining matches of Calcutta Football League blaming poor and biased referring in today's game against Tollygunge Agragami which ended with a 1-1 draw. MB officials have demanded a rematch from IFA and until their demand is met, they would not ply in CFL. 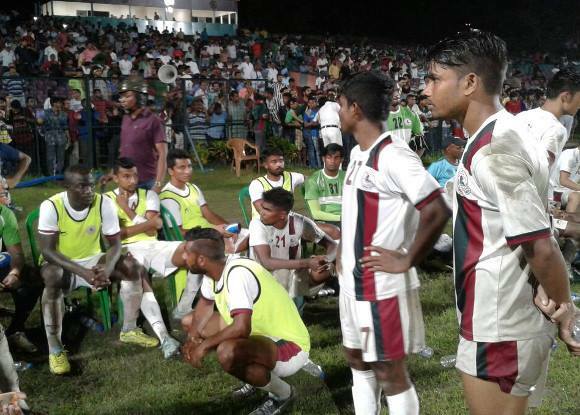 Supporters and Officials of Mohun Bagan invaded the pitch in the dying minutes of the game after Azharuddin Mallick's 92nd minute goal was discarded by the linesman, claiming it off side. Another goal scored by Daniel Bidemi at the start of the match was called off side by the referee. Prabir Das scored the only goal for Mohun Bagan in the 21st minute, charging in from the right flank and outfoxed the opposition goalkeeper to net the ball into the goal. Tollygunge equalized in the 87th minute thanks to Joel Sunday’s goal sending the supporters of Mohun Bagan into frenzy. Referee added four minutes into the game. The trouble started when Bagan’s Azharuddin Mallick’s 92nd minute goal was cancelled by the linesman citing off side. Bagan supporters outraged by the decision started breaking the boundary fences and entered the field. Bottles and bricks were also flung towards match officials and Tollygunge players. Several police officials were also caught in the barrage and resorted to lathis to control the crowd. Match Commissioner, Udayan Halder called off the match due to poor law and order.